To quote Mark Bittman, "real hot popcorn is one of nature's ultimate convenience foods". I could not agree more. Since my kids were old enough to eat it, it's been our snack food of choice. I have gone through all sorts of popcorn poppers and convenience products from the crazy ones that shoot more around the kitchen than in your bowl to a bowl specially made for the microwave to foil jiffy pop packs to every single variety of microwave popcorn available. But in the end, once I discovered how simple it is to just pop it in a pan on top of the stove, I didn't look back. I don't miss half-popped bags of microwave popcorn. Half-popped EXPENSIVE bags, I might add. On average, a 3-pack of microwave popcorn costs ~$2.°°. I can buy a 2-lb. bag of white or yellow popping corn for the same price. Less if it's on sale. And the stove-top method pops every last kernel in the pan. No joke. It's a rare site to see a stray kernel left unpopped. If I choose to go with Crimson Jewell or Black Jewell popping corn, I'm paying a few dollars more. BUT. I think that getting that extra dose of antioxidants (anthocyanins and polyphenols...as opposed to regular popcorn containing only polyphenols) that are present in these varieties is worth the splurge now and again. Plus, it's pretty. It looks the same after it's popped...you just notice the dark kernel on the inside instead of the golden one. The method that I use to pop corn on the stove top takes about two tablespoons of coconut oil to a half cup of popping corn. It takes between five and ten minutes from start to finish. When I first got The Food Matters Cookbook, I saw that Bitty does it basically the same way. Plus, he includes a microwave cooking method for those who still may not want to go stove top (though, it's so easy I urge you to try it). That said, I was pretty psyched when I found out this week's Food Matters Project choice was said popcorn (chosen by one of the founders, Kate). I can't believed I've never blogged about the actual popcorn-making process before. Another great thing about popcorn? Much like pizza, you can make it just the way you want it...be it exactly the same or varied...every time you make it. It never gets boring. If you like it au naturale, then pop and go. Or perhaps you enjoy it with just a drizzle of melted butter and a smattering of salt. Or even better, an aromatic salt. Classic is good. You can go with the quick and easy favorites like hot sauce or cheese powder (probably not the healthiest thing...but it's good). Kale dust is an earthy, delicious treat. Or perhaps you want to go extravagant with some Blue Cheese and Bacon popcorn. Been there. Loved it. Nigella's Party Popcorn is a real pleasure-inducer, as well. While I love to switch it up, I have two tried and true favorites. The first comes from the days when I used to go to the movie theater fairly often. I had to have salty popcorn in one hand and a sweet snack in the other. And of course, the salty and sweet needed to combine for one amazing mouthful. So, instead of toppings, you could also go with add-ins. My choices for the sweet 'n salty combo were always one of three things: Reese's Pieces, Sour Patch Kids, or Raisinettes. That was back in the day. At home, I throw in a handful of raisins and a handful of dark chocolate chips (more antioxidants!). It gets even better when you drizzle it with a bit of melted butter and some sea salt. This is a great combo to pack into baggies for healthy snacks for the kiddos, too. My number one, ultimate favorite popcorn topping in the whole universe is Truffle Oil + Black Truffle Sea Salt + freshly grated Parmesan. Best. Thing. Ever. EVER I SAY! If you are like me and have a spice cabinet that is bursting at the seams, you can come up with some phenomenal combinations by adding a pinch of this and a dash of that. A few that I really enjoy are Paprika + Curry Powder + Toasted Sesame Seeds + Cinnamon-Sugar + Salt + Melted Butter and Cayenne + Turmeric + Cinnamon-Sugar + Salt + Melted Butter. So. You say you want more suggestions? Well, hold on to the seat of your pants, because suggestions I have. Some of these are things I've used in the past. Some are suggestions from Mark Bittman. Some are things I saw in the latest issue of Vegetarian Times magazine. Choose from any individual option or mix them up. 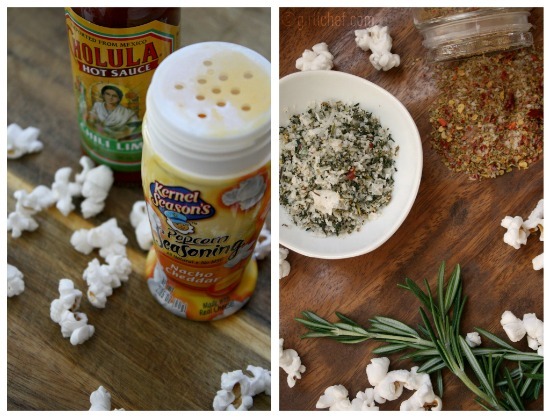 Do you have a favorite popcorn topping or add-in? I'd love to hear it! Put oil in a large, deep and/or wide pot with a lid. The one I use is holds ~3 quarts (with sloped sides like a wok) and is the perfect size for a batch this size. Turn heat to medium, add 3 kernels of corn, and cover. When the 3 kernels pop, remove the lid and add the remaining corn. Cover and shake the pot a bit while holding the lid. Cook until the popping sound stops, shaking from time to time, ~5 minutes or so. Divide popcorn into as many serving bowls as you wish and add your favorite toppings. Stir or toss and enjoy! 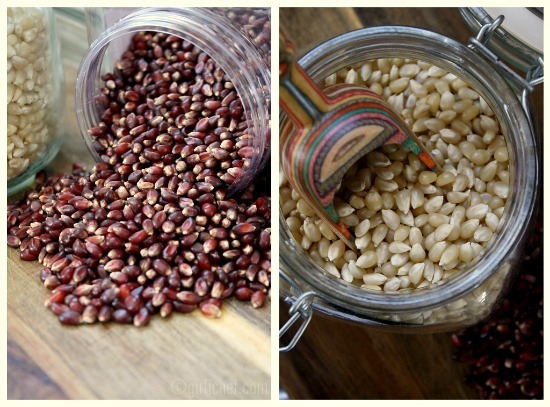 In a small glass container or brown paper lunch bag, combine ¼ c. popping corn with ¼ tsp. salt and fold top of bag over a couple of times. Microwave on high for 2-3 minutes, until there are 4-5 seconds between pops. Open carefully (steam) and toss with seasonings. Yum. I like all the flavors too. I love popcorn. I am a simple salt and black pepper or nutritional yeast kind of girl--although I have been putting truffle salt on it lately, and I occasionally make a coconut and dried fruit version adapted from a Tyler Florence recipe. ;-) Great photos! I grew up on stove popped pop corn, it was my mother's favorite snack and she had an old popping contraption that looked like it was from the stone age. But i have to admit, it was wonderful popcorn. I like the idea of using coconut oil, that sounds like it would add a hint of flavor. Of course when I had kids of my own we subsisted on bagged microwave popcorn. I think this is my cue to turn things around, great post. I haven't had popcorn in a seriously long time. Such an economical and good for you snack.I definitely need to get with the program. Love the salty sweet combination! Sounds perfect for the next time I need a little late-night snack. Great post! Popcorn has always been one of our family's fave evening snacks ... bowls of buttery popcorn, the fave TV show, and a napkin to keep greasy fingers from the furniture! haha! I'll have to try try some of the 'gourmet' options you've given us! Love playing with popcorn - so cheap - so satisfying - and so much fun! cinnamon sugar, yum!! we go through a TON of popcorn and always pop stovetop.. thanks for the link. My gardener loves popcorn and still makes it in an electric 1960's popcorn maker. Then he leaves it for me to wash.
holy cow, i don't think anyone has ever made popcorn look so good! 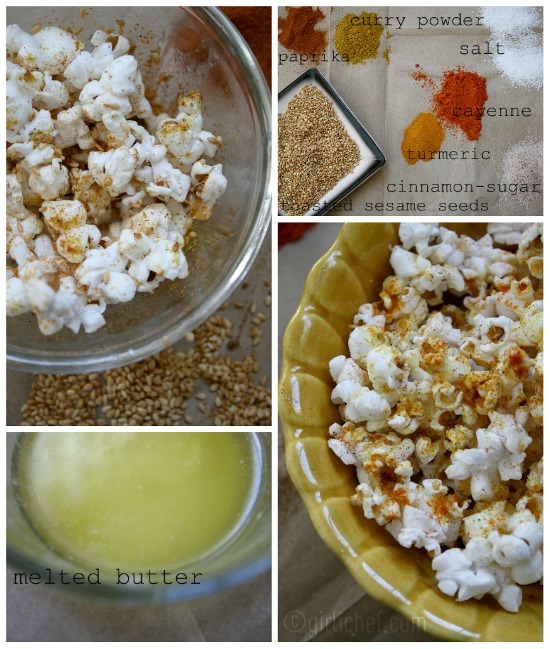 we LOVE popcorn, i can't wait to try some of these ideas! Oh, I have some truffle oil in hte pantry! I have to try that! I love all your ideas for bland and boring popcorn, Heather! 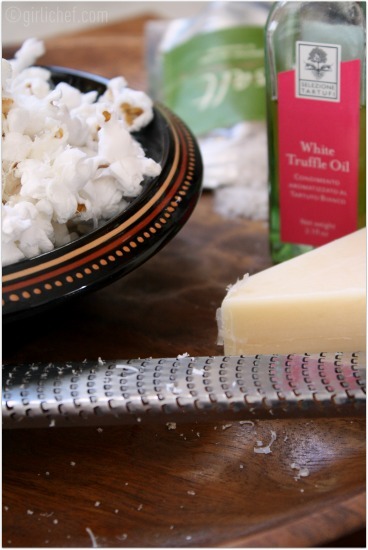 I especially love your idea with black truffle sea salt (oooh), fresh parmesan and truffle oil. Thanks for sharing! You have a beautiful blog and I'm glad to have found it. Qué ricas!! y con esas sugerencias wow!! me encantan con caramelo!! y aquí también les fascinan , las quiero hacer con parmesano!! me encanta el queso! Love that you offered so many seasoning ideas in one post! Great job! Wow - Kale Dust and Black Truffle Popcorn! Where have you been all my popcorn-eating life? So excited to try these combos! Wow, I love popcorn and can't wait to try it on the stove. Truffle oil and salt- yum yum yum. Oh my gosh you listed so many great flavors that I feel like I need to start eating popcorn for every meal for the next week to try them all! Yummy!! I've always loved popcorn but my dad hates the smell of it (weirdo) and so we were never allowed to pop it at home! These variations sound amazing! I'm so sad I couldn't participate this week but next week, it's ON. 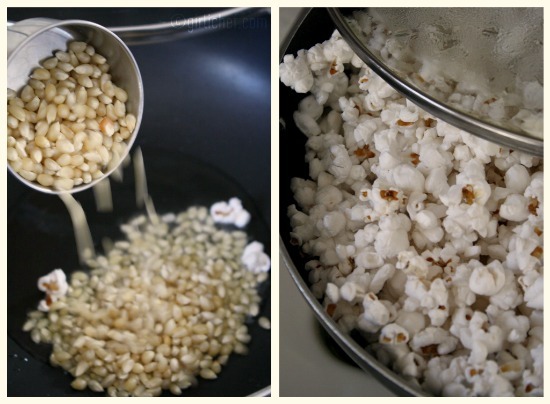 I did a post on how to make stovetop popcorn - I make mine exactly the same way. You are right, there is no looking back to that bagged kind with the artificial butter stuck to the side of the bag! 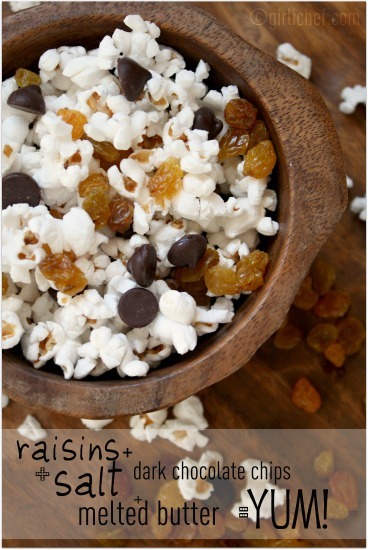 I love all of the flavors here, I will have to try some - I have to say, I was totally a raisinette/popcorn gal, and I just made some for my daughter the other day with chocolate chips and raisins! holy YUM! so many options in your post I love it. Happy Valentine's day! What a fantastic post...and the Truffle Oil, Black Truffle Sea Salt and grated Parmesan, I so have to try this! Yes, indeed, popcorn is great. But how come I've never seen beautiful red kernels like you have?! Those are really stunning! We actually managed to dismantle and fix our 25-year-old air-popper when it suddenly clapped out a few weeks ago. Ha! They made things to last in those days.